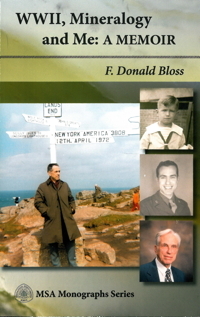 F. Donald Bloss is a distinguished mineralogist and is the leading proponent of and scholar in the field of optical crystallography of minerals. He is one of only two individuals to hold the positions of President of the Mineralogical Society of America and Editor-in-Chief of American Mineralogist. He is also the eponym of the mineral blossite. WWII, Mineralogy and Me: A Memoir begins with Don growing up poor in Chicago before and during the Depression, weaves through his service as a Conscientious Objector during WWII, and follows his academic career from his early school days through his role in helping to establish perhaps the preeminent department in the mineral sciences in the world at Virginia Tech. Don traces his life through those things important to him, including family, students, colleagues, and, above all, Louise, his wife. As in most lives, there are triumphs and heart-breaking tragedies. Don also provides a front-row seat to anyone who wishes to see the evolution of optical mineralogy over the past half century.